Protect your plants from foot traffic while adding style to your lawn with the Panacea Scroll Garden Edge. 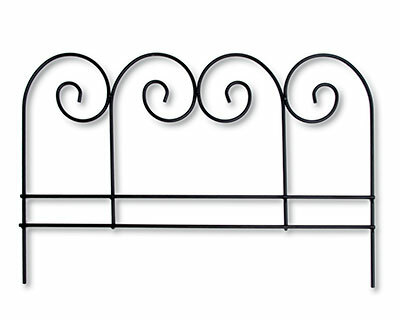 Four curved sections join and create a scalloped edge, adding just the right amount of ornamentation to your lawn. Stake several of these edges in a row to create a modular fence, perfectly separating your plants from your yard. The black metal construction withstands use outdoors for many seasons, while seamlessly blending with any color scheme. This Scroll Garden Edge will help keep your flowers wonderfully framed year after year. Note: This case pack includes 12 of the Panacea Scroll Garden Edge Sections.